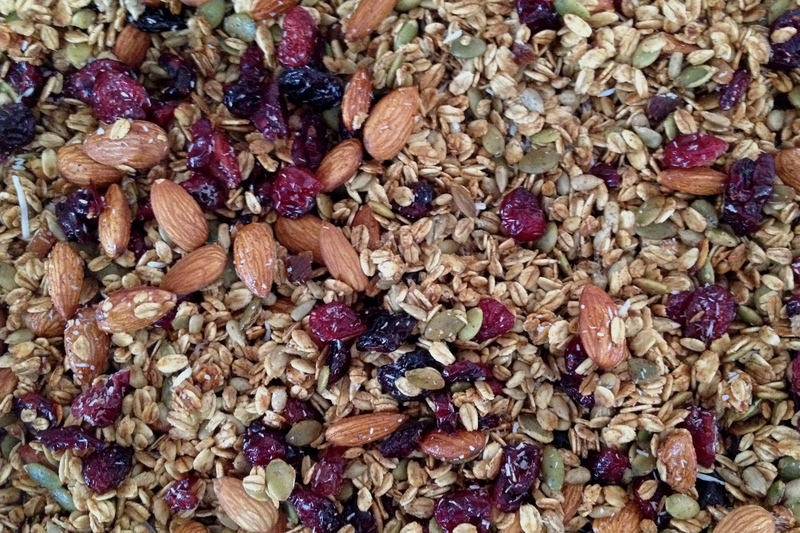 I was making granola recently, which I have done so many times that I no longer really check the recipe or do a whole lot of measuring. Since I almost always make a double batch, I figured I should adapt the written recipe to reflect the actual quantity that I make. Even doubled, I still find the granola disappears quickly. As I updated the recipe, I realized there are a few more tweaks that have crept in over time…experiments that turned out to be tasty and so they became part of the routine. That is not to say that the original recipe is not still valid; it’s simply another option, and one you may find you like better. But these days, here is how I am making my granola. Combine the oats, nuts, seeds, and spices in a mixing bowl. Add the honey and maple syrup. Stir. Keep stirring. It will take a little elbow grease, but with the help of a rubber spatula, the honey and maple syrup will coat and moisten all the oats and nuts. Line a large baking sheet with parchment paper. Spread the oat mixture out on the baking sheet. Bake in a 300F oven for 20 minutes. Give it a stir. Bake for another 20 minutes, or until lightly toasted and crispy. Add dried fruit and shredded coconut and stir to combine with toasted oats while still warm. Return to the oven for 5 minutes. Allow to cool before transferring to an air tight container for storage. Enjoy with fresh fruit and yogurt, or I like to add a little granola to my warm oatmeal…kind of an oats two ways breakfast dish. The granola freezes well, so keep in the freezer and defrost a new bag as you finish up your fresh stash. You can view the original granola recipe here. It’s still quite tasty. Just slightly different. Use whichever one you prefer…or invent your own version!